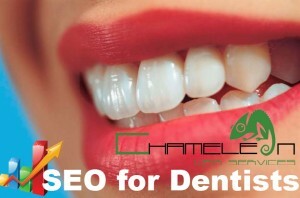 If you are UK Dentist looking to achieve a Google first page ranking then Chameleon can help you achieve your goal. Chameleon is one of the leading UK SEO companies with a proven track record in all sectors of the Internet with clients including leading hotel chains and large blue chip companies. The dental sector is not anywhere near as complicated when compared to our current projects with other large companies trying to achieve success online across the UK even globally. There are many companies working with a focus on dental search engine optimisation better known as SEO. These companies promise No 1 rankings in Google for all Dentists and this is something we find comical as they are trying to work with all dentists and get them all top of Google yet only one can be top and there are only 10 places on page one. Our business model is to work with only one dentist in a chosen area and this means that our focus and attention is to achieve a Google first page ranking for only one client for specific set of chosen keywords. Why use Chameleon to achieve success for your dental practice? We have been carrying out SEO services in the UK since 2001 and over achieving for our clients as we never guarantee number spot but normally achieve number one positions. Our team of SEO consultants will work with to understand how we achieve the success and will not give sales talk and false promises. Only one dentist in specific area location. Proven track record in more difficult sectors than SEO For Dentists. UK based and all operations are carried out in the UK. Google SEO Experts since 2001. Your potential patients are using Google to find a local dental practice for emergency dental work or to find a new dental practice as they are unhappy with the current practice. New home owners also come into a new area and may not know the area at all and this is where being in Google and in a high position will give you the advantage over the dental practices in your area that do not use Google as a marketing medium.